Because I take my lunch to work most days, I was happy after finding out I'd have the opportunity to review some products from Trudeau!! Trudeau is a Canadian manufacturer and industry leader in the design and development of modern kitchenware. FUEL by Trudeau is a collection of fun, functional, on-the-go and BPA free products. Its innovative shapes are geared to today's active lifestyles. They are all easy to use, easy to clean and environmentally friendly!! The FUEL Lunch Set includes a sandwich box, a snack & dip container with spreader and a juice bottle. At first, I thought this would be more suitable for kids but to my surprise, it's great for adults too! The sandwich box is great - the one piece construction is innovative and provides a tight, foolproof seal. The snack & dip container works with any kind of snack, from crackers to carrots, and the juice bottle is the perfect size for any lunch time beverage. The FUEL Condiment Set includes three cute and colorful containers that can hold any type of condiment you choose. I found that they were perfect for my salad dressings and veggie dips!! The FUEL Food To Go Container was probably my favorite. 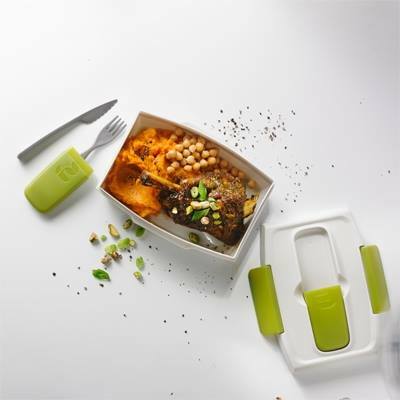 It includes cutlery in a case that snaps into the top of the container, never again will I have to worry about forgotten cutlery!! The lid locks into place, keeping food secure. This container works with any kind of lunch, whether it's a salad or leftovers from supper the night before. Overall, I was very impressed with Trudeau's products and would recommend them to anyone looking for on-the-go containers and accessories. They are microwave & dishwasher safe, high quality and appealing.